In the past week, I’ve been managing to intersperse bits of BurnoutChibi work between hosting extra hours for the 2.00gokart students as they edge ever more towards completion. 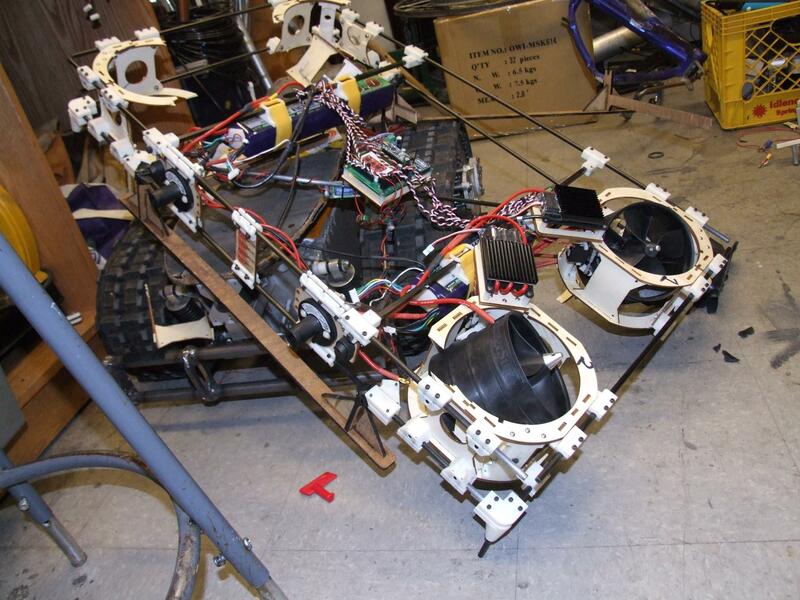 On Wednesday, the “Milestone 7″ mechanical inspection occurred, where everyone had to demonstrate their rolling frames with steering and braking. 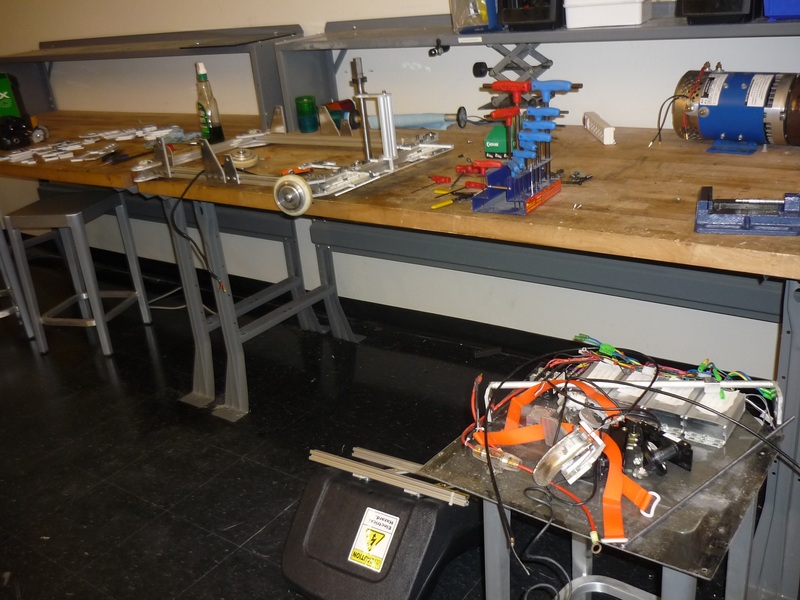 The next steps for the students from here are focused entirely on assembling their electrical system. In fact, two teams have already blitzed their vehicles to completion, and more are surely to follow (parading them around during CPW is a huge motivator). I’m going to make a separate post about the progress of the class later – all I can say for right now is that this year’s competition is going to be awesome. This work left me with a pile of redundant electricals – namely 4 more Jasontrollers and the massive A123 B456 battery. Needless to say, these will probably find their way into some other silly rideable thing. The plan for BurnoutChibi’s electrical system is actually to use my left over 10S 5Ah lithium polymer packs, instead of making a custom pack or keeping the A123 pack. I decided to this mostly for the power and energy density of the lithium polymer packs (Chibikart 1 weighed 53 pounds because the big A123 bus battery module weighs almost 20!) as well as the simple fact that said lipo packs have been sitting for almost 2 years, and I really don’t want to see them go to waste. The lipos themselves are from the erstwhile Deathcopter, so BurnoutChibi will surely be the health and well being hazard I envisioned it to be. 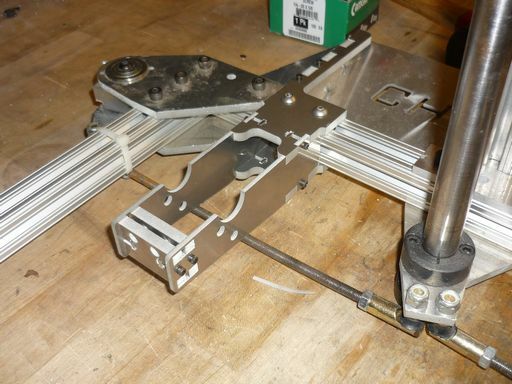 The first appendage to the old frame is the new style brake pedal. At this point, I haven’t even removed the old steering linkage yet, but I wanted to see if it would interfere with the new position of said linkage. I started from the rear with fitting the Vex Ball-shitter transmissions onto the “goalpost” mounts. 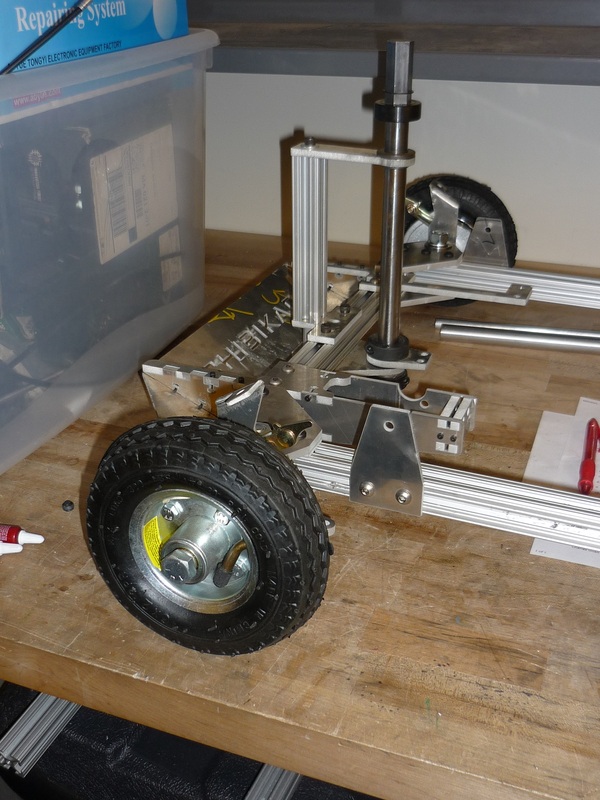 This whole ‘rebuild’ is essentially replacing Chibikart 1 frame plates with specially crafted DPRC ones. The only difference between this rear corner and DPRC’s is the goalposts! 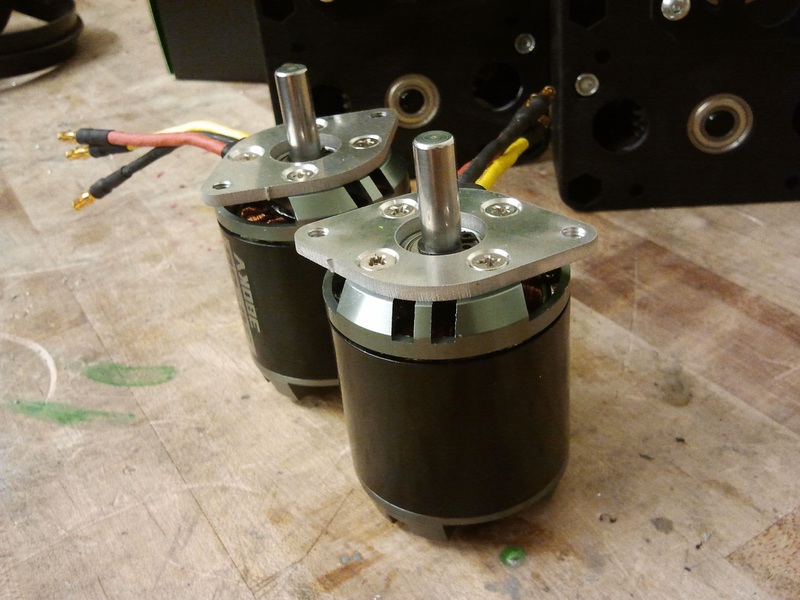 I focused on getting the motors mounted and the rear end together. 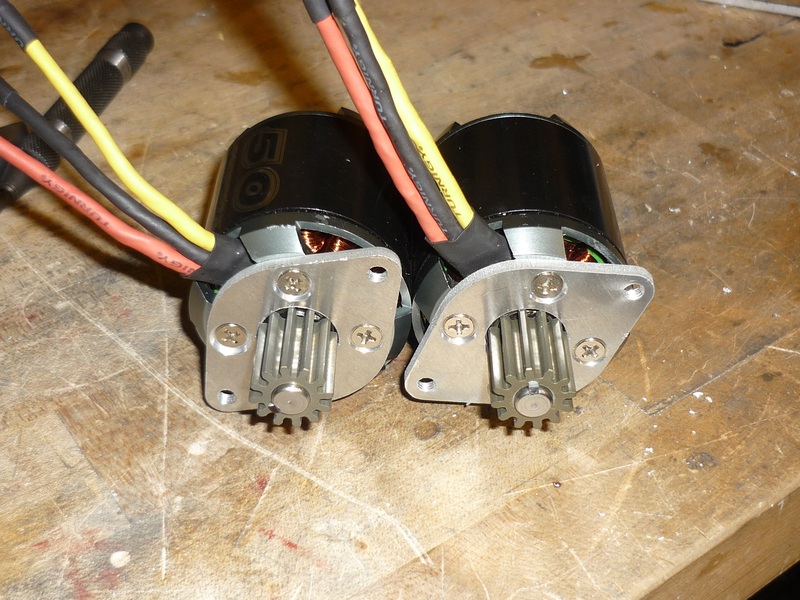 Here, I’ve mounted the NTM motors to my NTM-to-CIM converter plates. Eliminating units, the result of this evaluation is something which is basically like a CIM, but 4 times more power dense. There’s only one problem. The NTM shafts need to have a 2mm keyway cut into them so I can easily used the keyed bore supplied with most FIRST OEM parts such as the Vex transmissions (The fact that I can say “FIRST OEM” is unsettling). As it turned out, these shafts are casehardened. Wow, Hobbyking, you’re classy now – what this meant was I could not use my single HSS 2mm endmill to machine the slot. Instead, I went on eBay a few weeks ago and bought some 2mm solid carbide endmills. 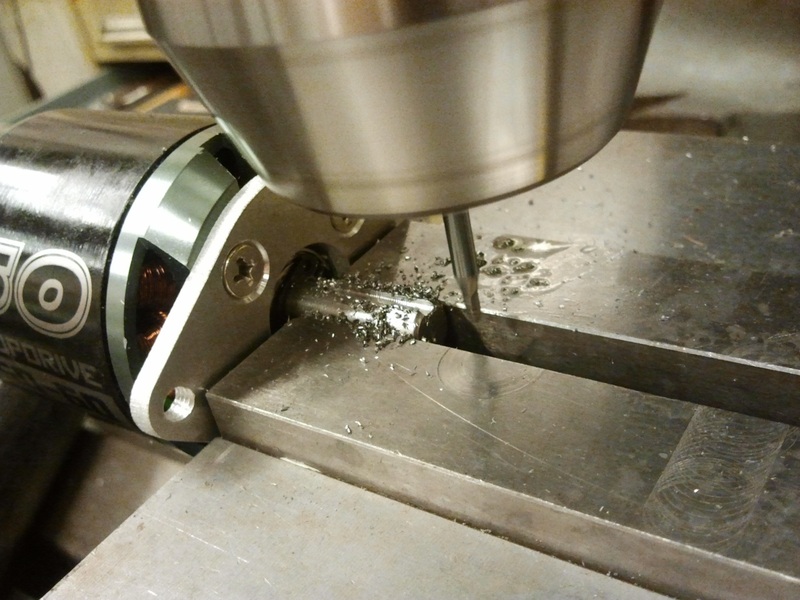 I recommend keeping a set of carbide cutters around for dealing with troublesome materials; the downside, of course, is that they are more brittle and need a stiffer machine setup. I faced the slight issue of the endmill being too short and the Bridgeport spindle being too fat to reach the nether regions of the motor. So I did what any self-professed machinist wouldn’t do, and chucked it up in a drill chuck. In my defense, I bought this integral-shank keyless chuck just to do dumb things like this. I cut the keyway just a little short of actual dimensions because the NTM shafts were not long enough to use the included retaining ring with the gears. So I had to press the key in,and will need some creative gear pulling if I ever wanted to remove these gears. And here they are mounted. I found the sheer number of hexagonal sockets on the gearcases a bit confusing at first, but now appreciate how versatile they can be. Chain tension is adjustable using the slightly slotted mounting holes. I inserted locknuts (nylocks) into the opposite side hex sockets, so torque retention will be positive. Notice how the seat mounts have been turned around. This was necessary because of how big the gearcases were. The seat mounting centers, and overall position, will remain unchanged. Crawling up the side of the vehicle, I reached this build’s star attraction: The gear shifter. This came together amazingly well, and the feel of the ball detent plungers is extremely satisfying. Heading up front, I popped out these new steering knuckles. In keeping with the tradition of doing the least possible work, these were specifically designed as drilling operations in a 1″ aluminum square barstock. The four flange holes will be where the drum brake mounts. 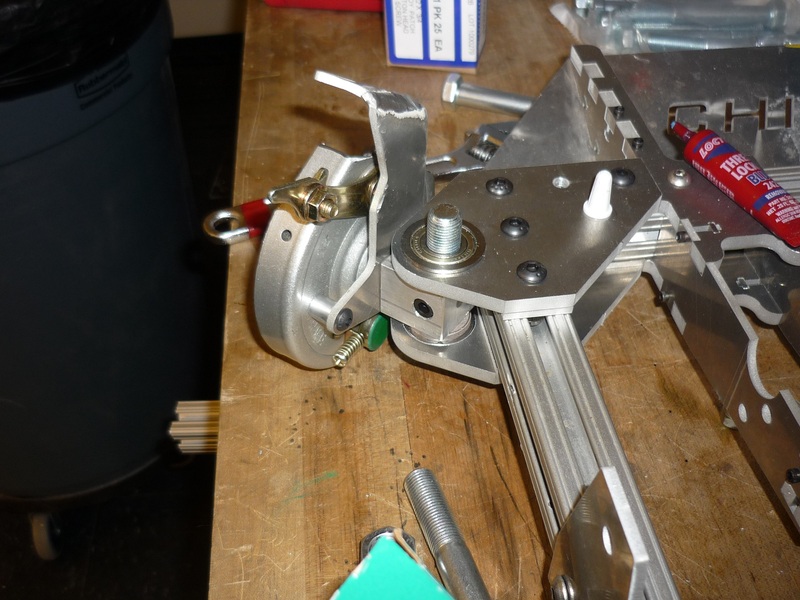 Continuing work on the front end, the drum brake mount has been attached and the new narrower steering…ears? are mounted. I’m not sure what to call them on Chibikart. They’re too short to be A-arms or wishbones. Recall the new steering linkage arrangement – the crank arms are basically socket wrenches that fit over the hex head bolts. Motion is transmitted via giant set screw in the steering knuckle. To ensure positive engagement, I machined a deep flat into the hex head bolt shanks and picked flat-bottom set screws to maximize the contact area. 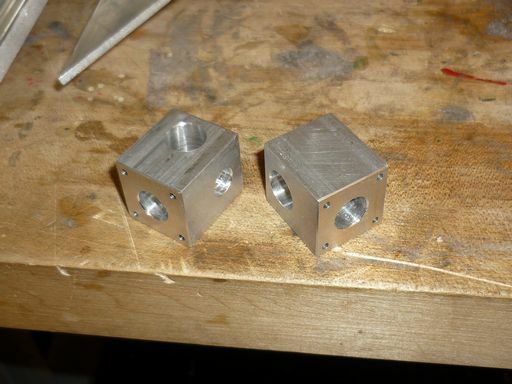 To retain the crank arms, I center drilled a hole and threaded it for a retainment bolt. 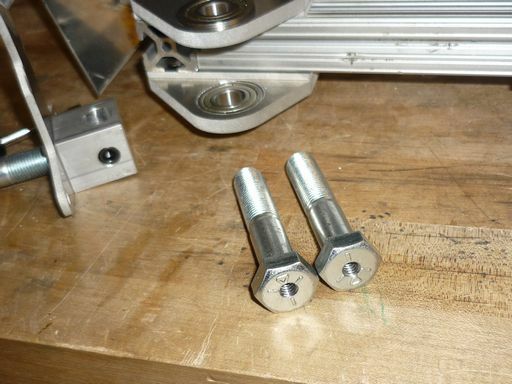 Otherwise, the crank arm is thinner than the bolt head and will be free to float about 1/16″ or so. I moved on to chopping up the 90mm drum brake to fit up front. The mounting method I ended up devising would have been fine with keeping the giant torque arm, but the design would be cleaner without. To maintain the cleanest possible lines, I brutally slashed the housing with a Dremel cutting wheel. 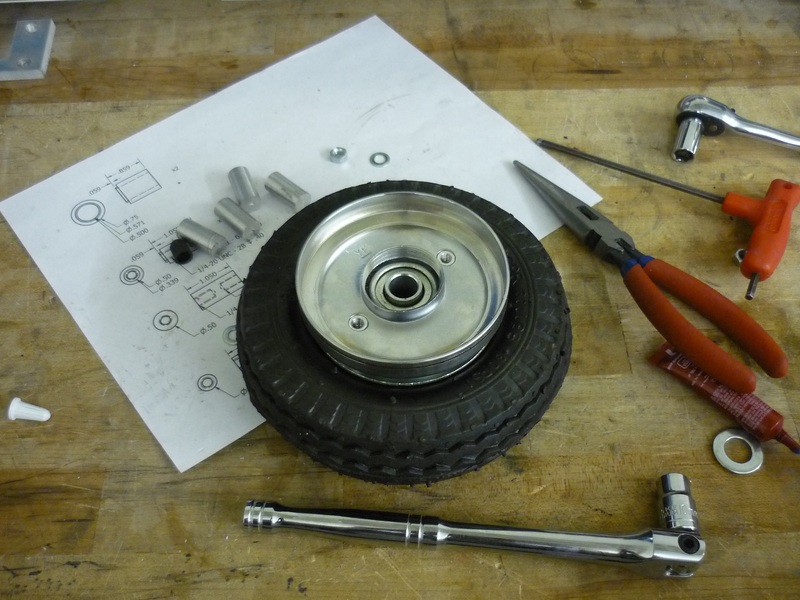 To attach the drum brake itself to its mount, I first had to machine the little round spacer which adapted the 14mm bore of the brake housing to my 1/2″ bolt wheel spindles. I sandwiched the brake housing between the mounting bracket and the spacer so it was reasonably centered. 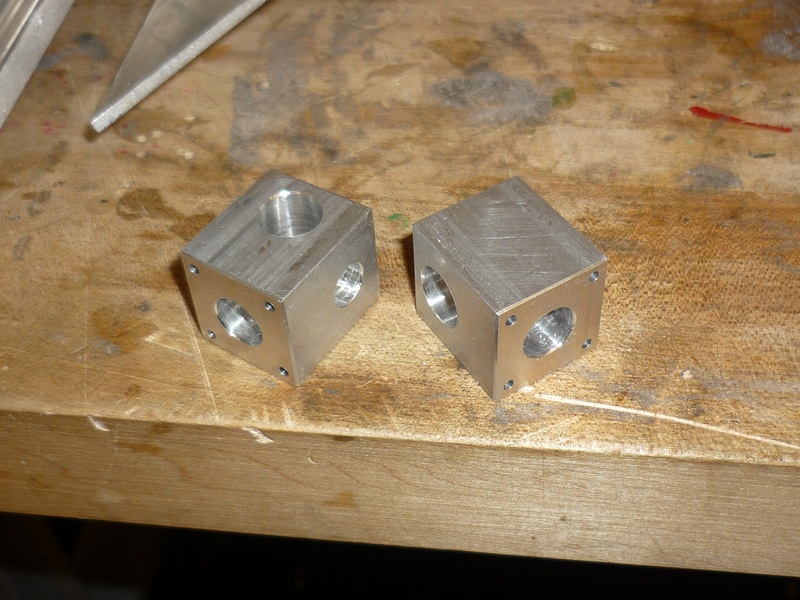 Next, it was a quick drill press job using the mounting bracket holes as a drill template. The steel housing on these brakes is just thick enough to hold a few threads of #10-32, so a socket cap screw was screwed directly into it through a standoff. 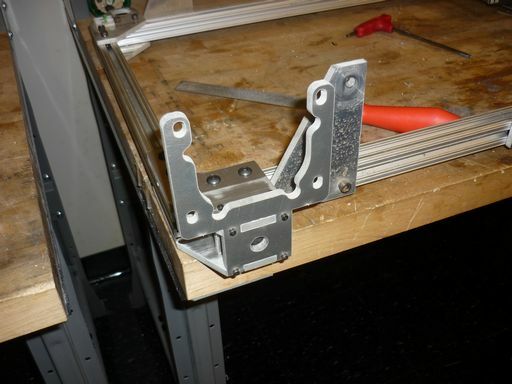 The mounting bracket itself involve one sheet metal bend to create a spot which will eventually anchor the brake cable. Well, I managed to bend it the wrong way the first time. Heating up the aluminum with a torch and carefully bending it back the other way worked, but the metal still cracked on one side. I had a buddy on MIT FSAE lay a quick TIG bead across it (see the irregular texture where the sheet metal arm bends left). The brake drum mounting itself is what I’d call “kinematically suboptimal” very nicely. Basically I squished the slightly tapered stamping flat on a hydraulic press to get a flush mounting face on the bottom side. Then, two standoffs which each have a small shoulder that is precisely fitted to a mounting hole keep the drum attached to the wheel. On the top side, the standoffs have a 1/4″20 thread so I can use already available button head screws to retain the rotor. On the other side, the standoff is tapped M6 X 1 to interface with the original wheel lugs bolts. The concentricity, needless to say, is less than stellar, but turned out way better than I had anticipated. I’m likely to replace this whole rig with a custom machined aluminum dish that has M6 x 1 holes tapped into it so I can just dismount the whole tire without causing loss of alignment. The brake does scrub, but only slightly and intermittently, and works very well otherwise. I have no doubt that this thing can lock up and skid. And the front end is basically together. 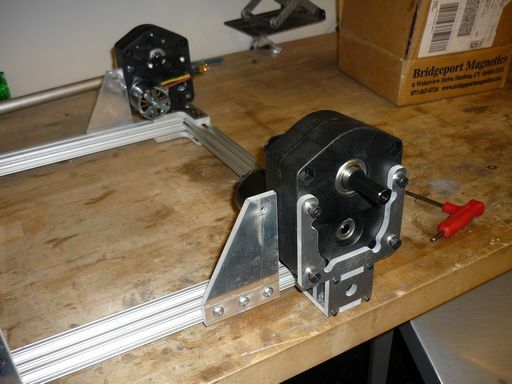 Work now will move to the rear again with assembling the drive wheels and sprockets. I have an order of brake cables and associated parts coming, so I hope hooking up the whole drivetrain and shifter this week is a possibility. Those band brakes. When I tried them I found the small holes were different distances from the center of the drum. I also tried a custom aluminum brake hub, but the surface galls like nobody’s business. Over the course of a few months the hub had shrunk a couple millimeters. 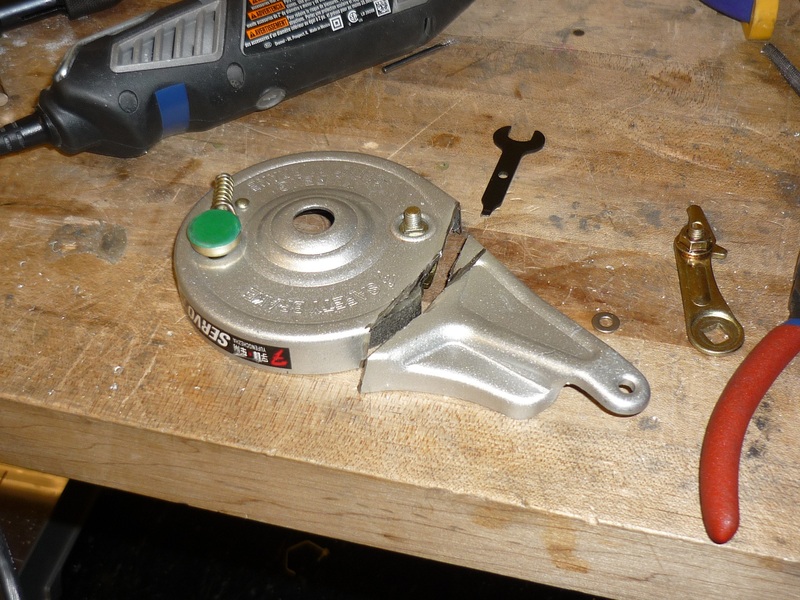 In the end I cut off the face of the original steel hub and pressed it onto an aluminum core. Yeah, aluminum is probably not the best choice for such a thing, but I also really don’t feel like machining that much steel. Maybe cutting the drum portion off and putting it into an aluminum housing is the better solution. That was really awesome work! 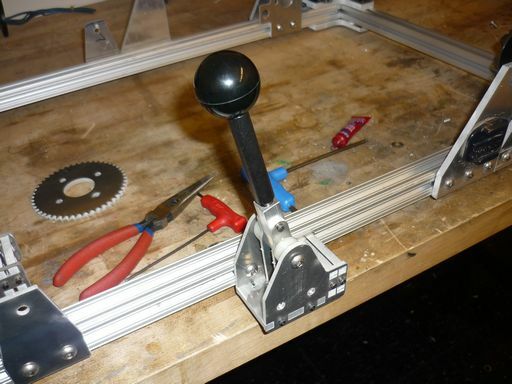 CAD tools may useful for these bigger designs. Theme created by miloIIIIVII | WordPress | Entries (RSS) | Comments (RSS) | 32 queries. 0.229 seconds.